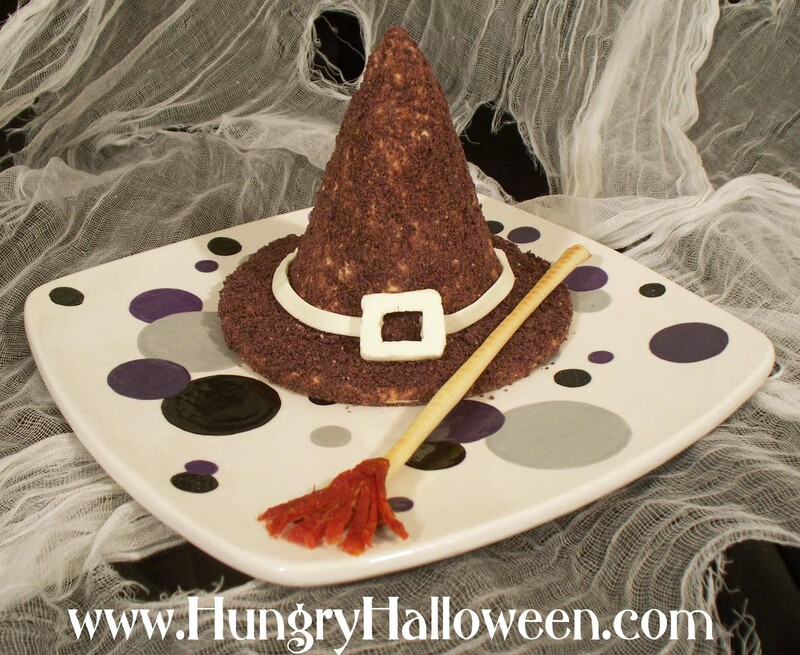 October 21, 2013 By This post may contain affiliate links. 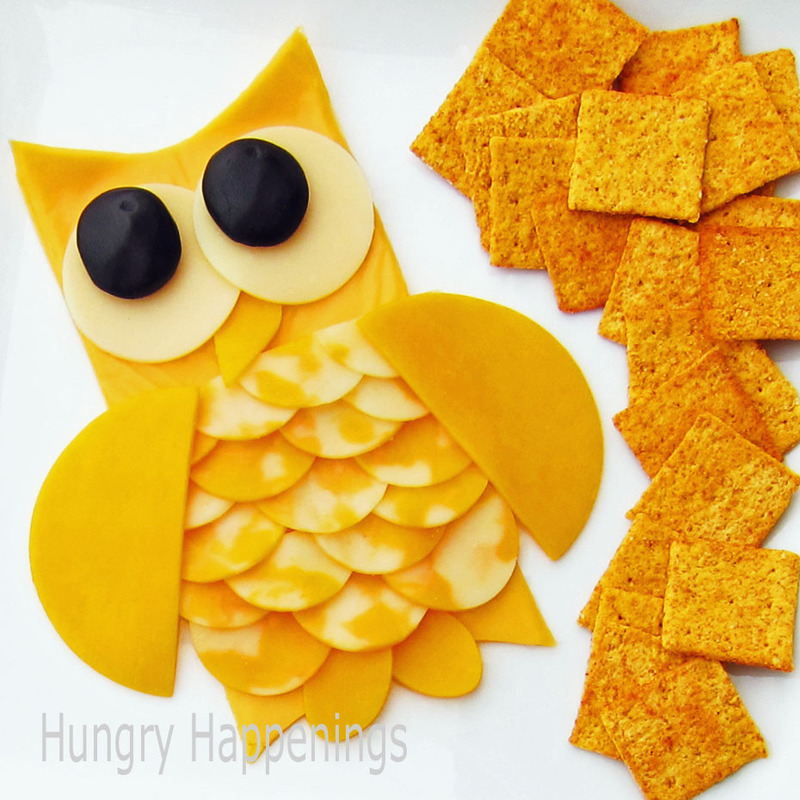 Did you know you can color cheese to make festive Halloween snacks? 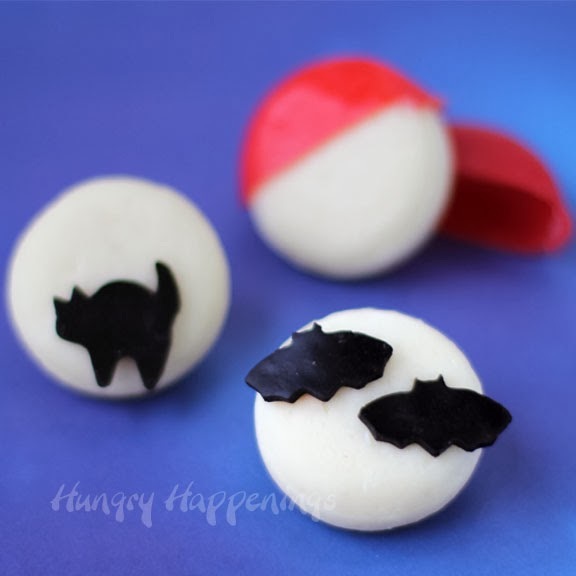 It’s easy to make cats and bats to add to Full Moon Cheese and Crackers. 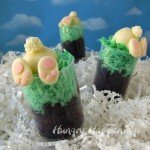 Kids will love these treats. A while back I discovered Velveeta Queso Cheese could be melted, colored, spread thin, then cut into decorations. I used the colorful cheese to make some Cheese Ball Birthday Cakes. For Halloween, I wanted to create some really simple cut outs of cats, bats, and witches to go over some full moon shaped cheese and crackers. I figured turning white cheese black would require a lot of food coloring, so I decided to use Velveeta’s original orange colored cheese. I’m pretty sure it took less coloring and it was vibrantly black. 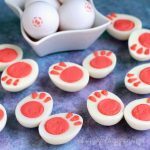 I cut out shapes and added them to round crackers topped with white cheese and to Baybel Cheese rounds. 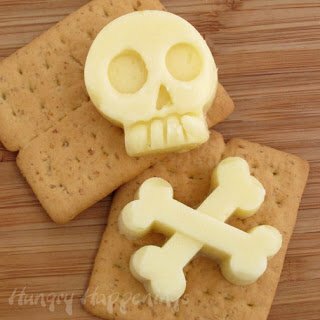 Both made fun and easy Halloween snacks. 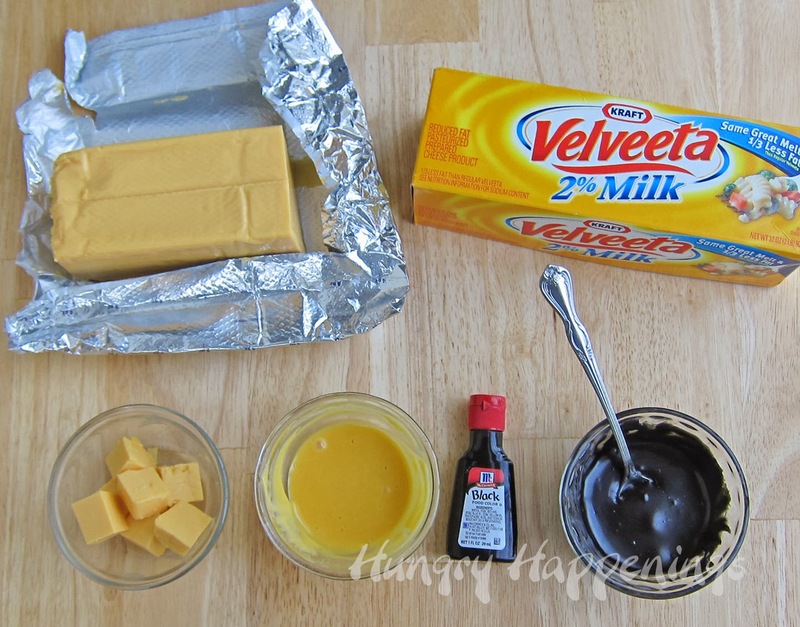 Cut Velveeta cheese into small chunks and melt in microwave. Stir in black food coloring. Quickly spread the melted cheese into a thin layer on a non-stick baking mat (Silpat.) Freeze for 10 minutes. 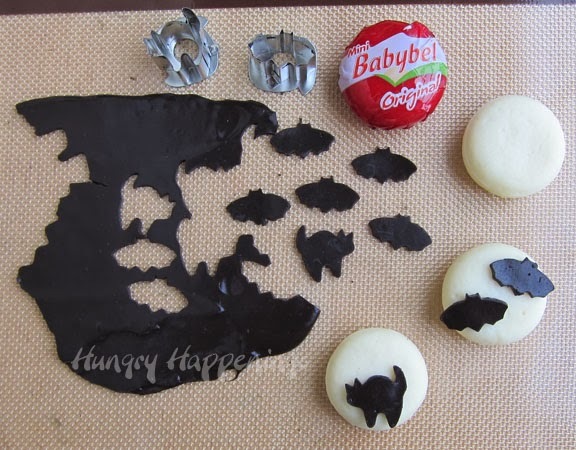 Cut shapes out of the black cheese using small cookie cutters. If the cheese gets too soft, put it back into the freezer for a few minutes. 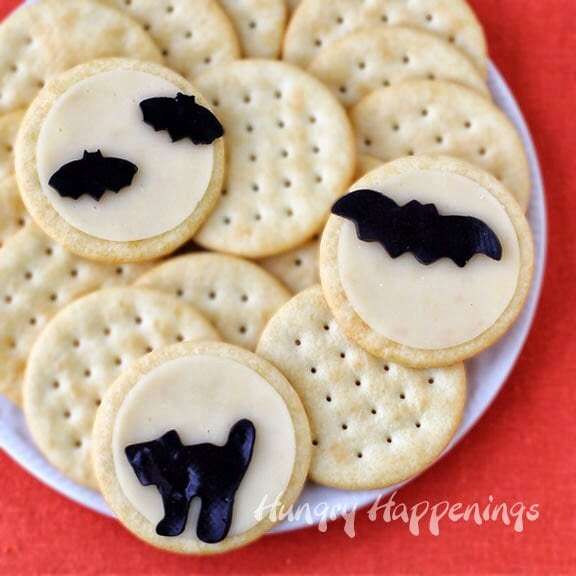 Cut white cheese slices into rounds using cookie cutter. Just before serving set cheese rounds on crackers and add a black cheese shapes. 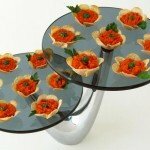 Alternately, top Baybel Cheese rounds with cut outs. 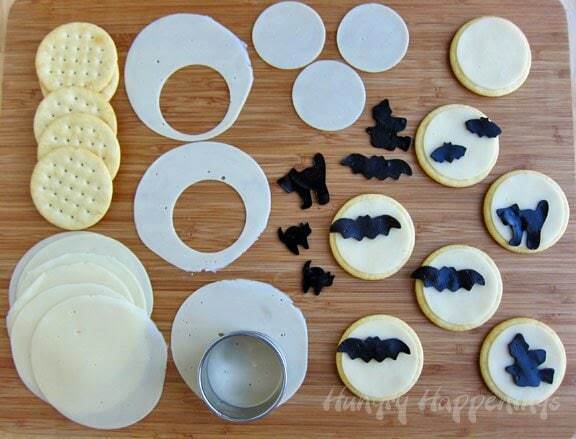 You’ll need really small cutters to make bats and cats that will fit on top of these pieces of cheese. 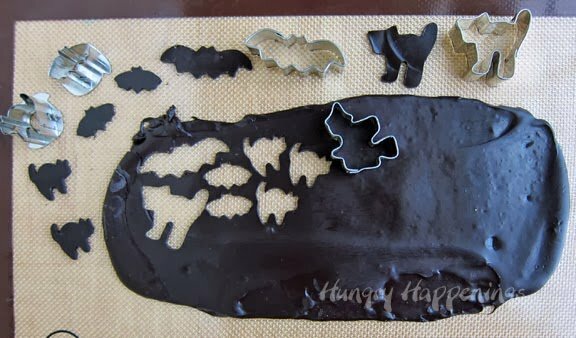 I used Halloween Linzer Cookie Cutters. They were the perfect size. See the Amazon link below, if you’d like to buy some of these cutters. There are six shapes in the set. I LOVE them. 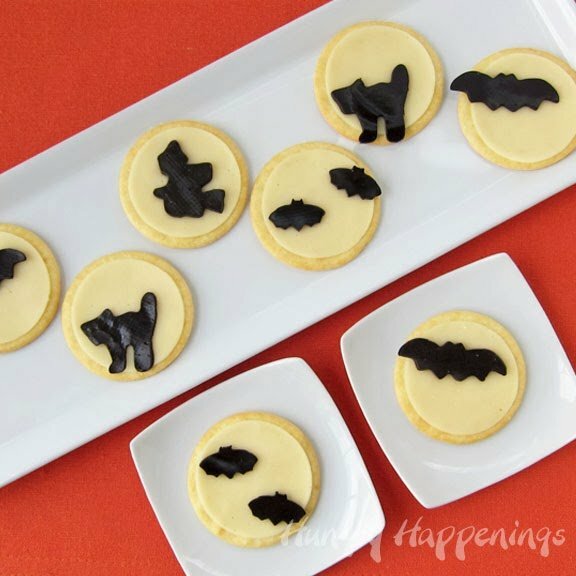 My daughter just loves bats and spiders on Halloween so these will be perfect! Yep, I am working around the clock right now. Halloween is almost here! 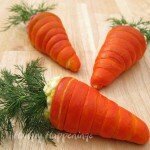 Your cheese technique is amazing! 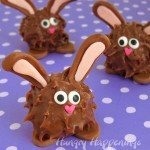 These look so adorable. 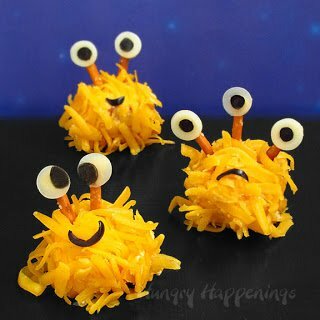 My girls love cheese, so they'd go nuts for these! 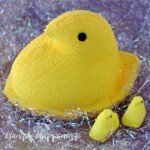 These are so cute! 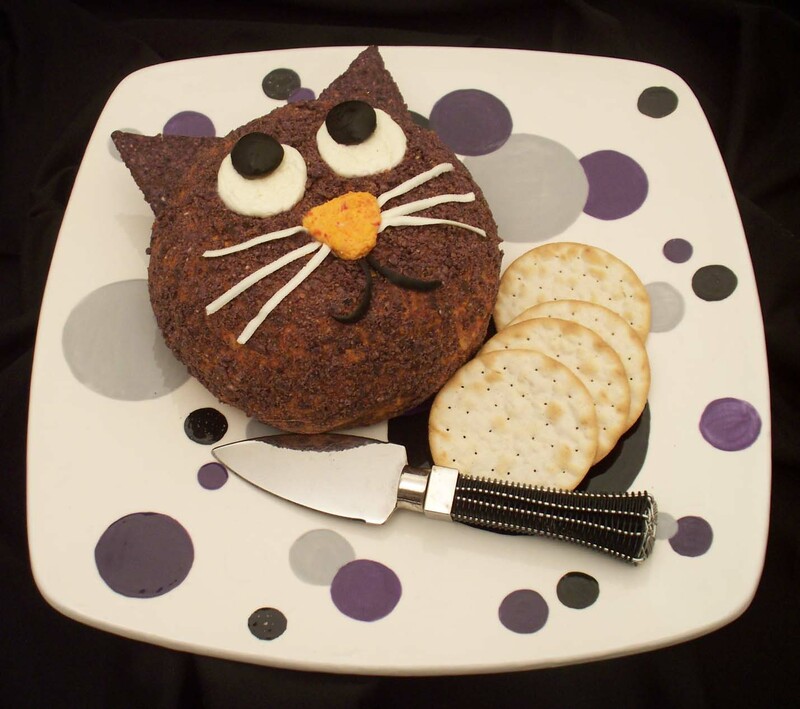 I would never have thought of dyeing the cheese to make bats and cats! 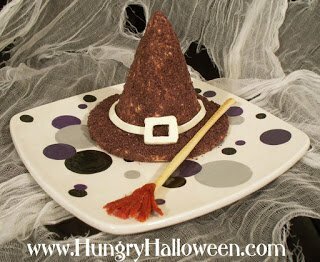 This is a really fun and different idea to bring to a Halloween party. Thanks! I love how easy it is to turn the orange cheese black. Very cute, thank you for linking up at Moonlight and Mason Jars! 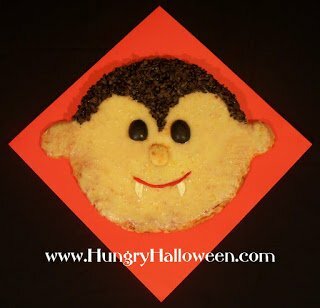 I am sharing these fun treats on my FB page today, Once a Mom Always a Cook! Thanks so much for sharing this project with your Facebook fans! Beth, are their any other cheese that can be melted besides the velveeta or american cheese. i dont care for them and have tried some but didnt work well due to the oil content. 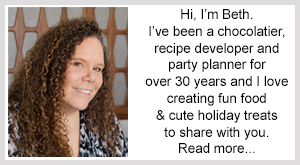 thanks……..i love all the ideas! Hi Cindy, I have not found any others yet. I'm always looking, though. Most of the cheese I have tried to use have too much oil that seeps out when heated. Velveeta sure doesn't take like a good cheddar, but it does melt and harden like I need to make these cut outs. If I find another cheese that works, I'll be sure to share that information here!